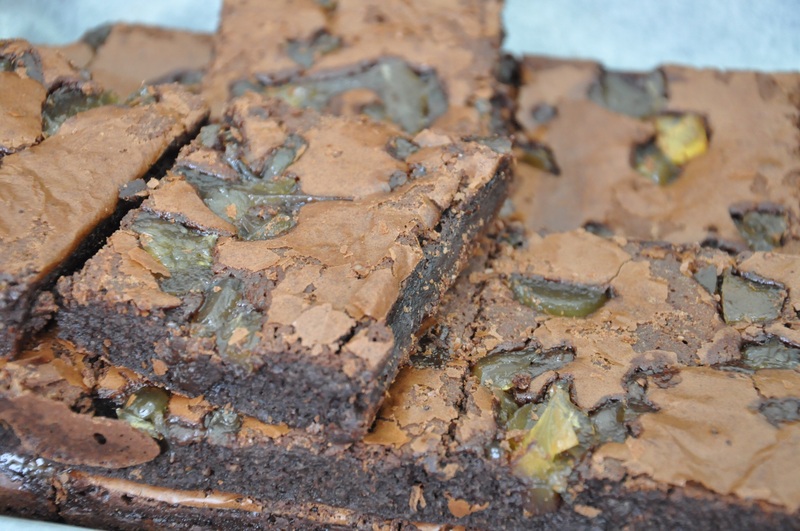 I’d never heard of Froth & Fodder until their appearance at North Star‘s Latte Art Throwdown. 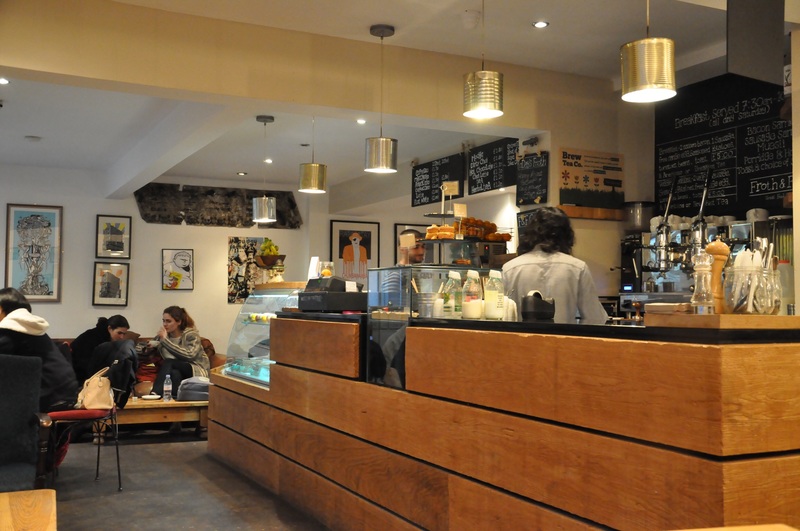 This place was originally called Cool Beans until a few years ago, and can be found opposite Leeds University’s Parkinson Building on Blenheim Terrace. Mostly frequented by students, lecturers and other University folk. As not being a part of Leeds University’s alumni I’ve never really had much reason to venture here, often driving up through the University on the way to Headingley and beyond. 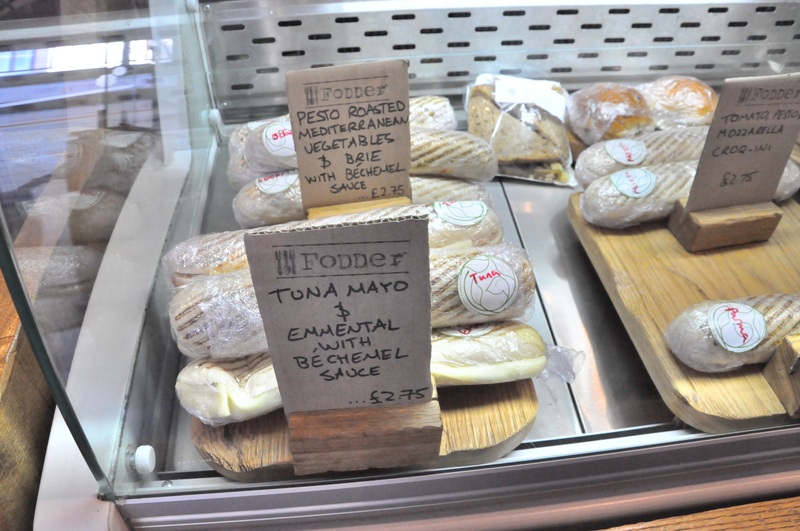 It’s definitely a bit of a hidden gem with it’s subterranean feel as you walk downstairs from street level. 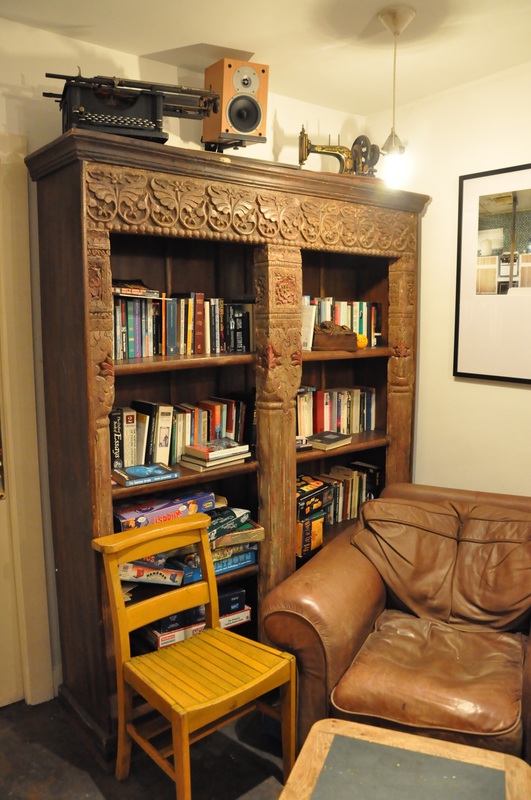 With its relaxed feel and quirky mix of furniture, such as leather sofas, old school desks, wooden P.E. 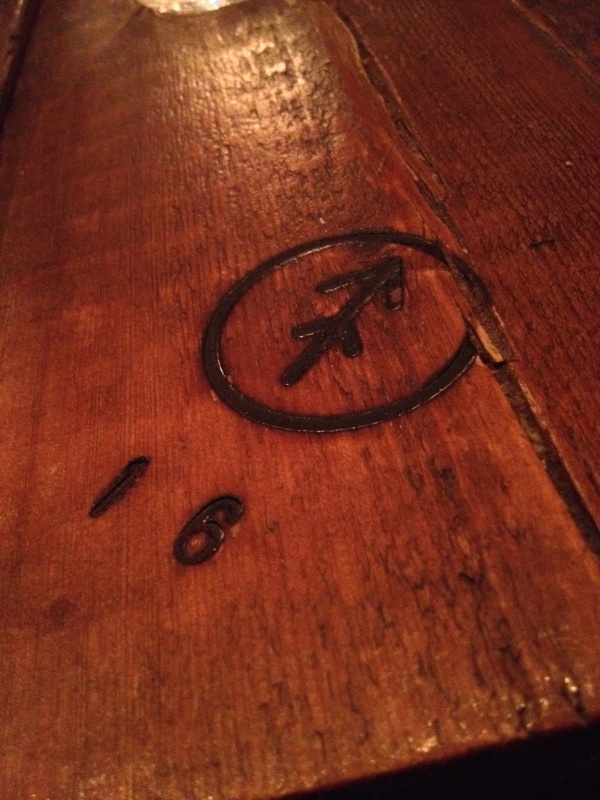 benches and artwork on the walls, there’s a laid back atmosphere. 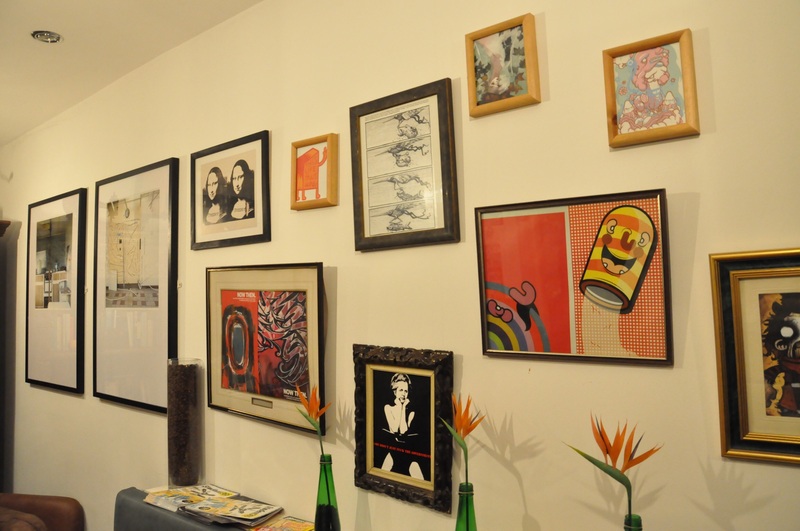 Sam, the Head Barista said they like to have art exhibitions at Froth & Fodder, in particular they recently had art work from Leeds College students exhibited. 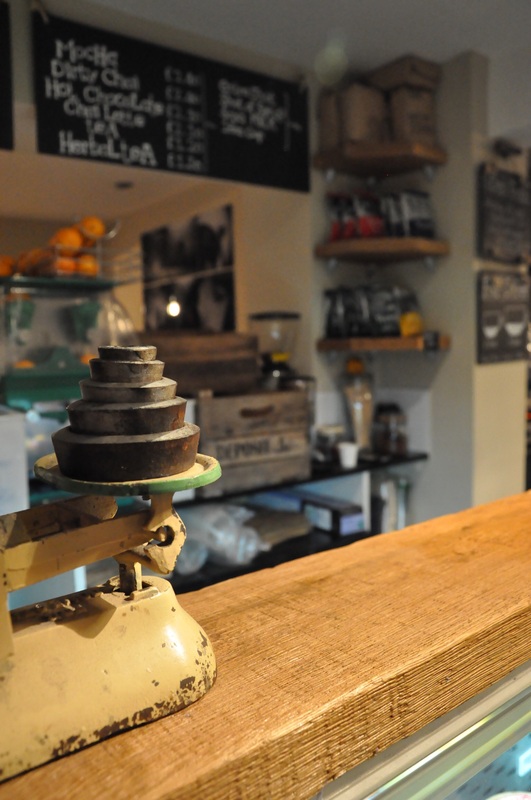 Their coffee’s from New Town Coffee Roaster based in Edinburgh, who provide them with a seasonal custom blend. 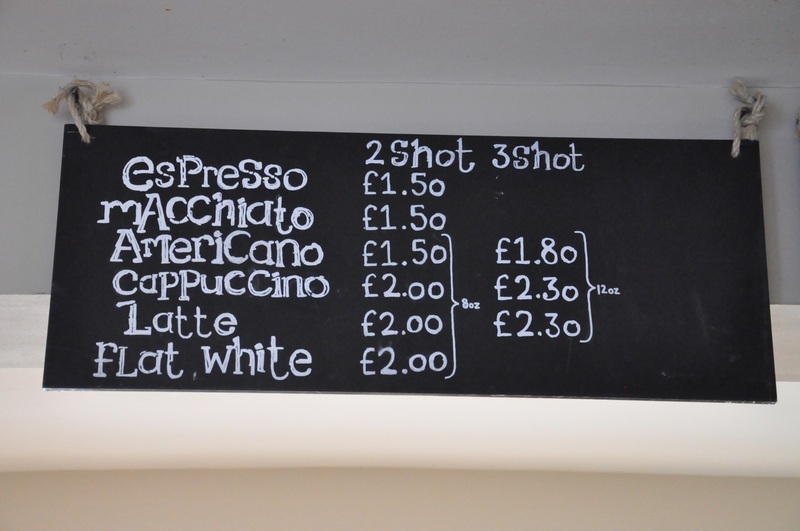 In the future they would also like to incorporate guest coffees to their menu too. 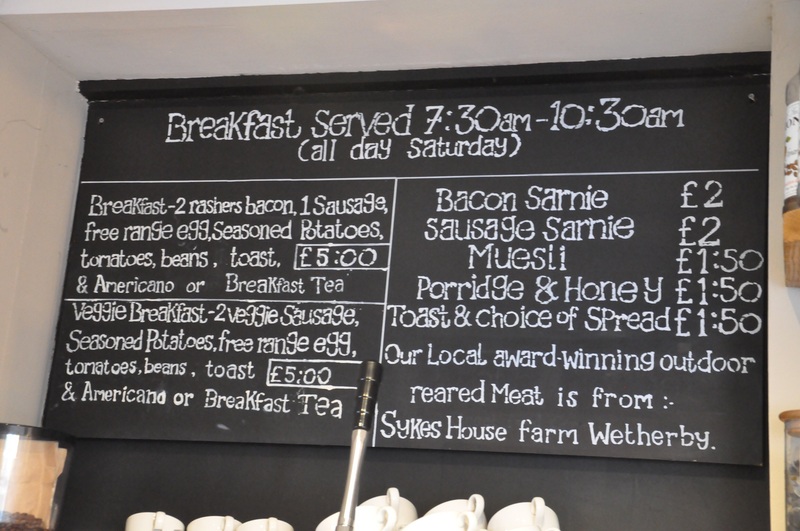 In terms of food they have a breakfast menu, including the customary full breakfast (meat and veggie versions), and their best seller is a 9 hour slow cooked belly pulled pork sandwich using meat from well known Sykes House Farm from Wetherby. 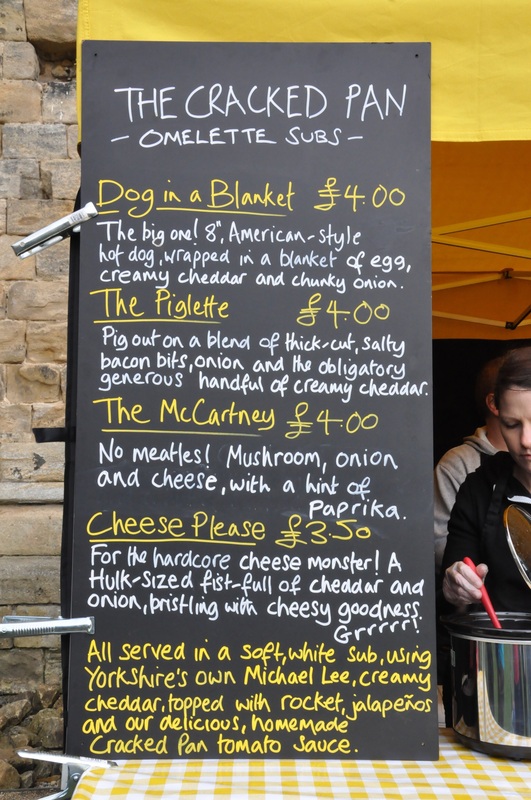 I HAD to go for the pulled pork sandwich, I thought to myself it can’t be so popular for nothing!! 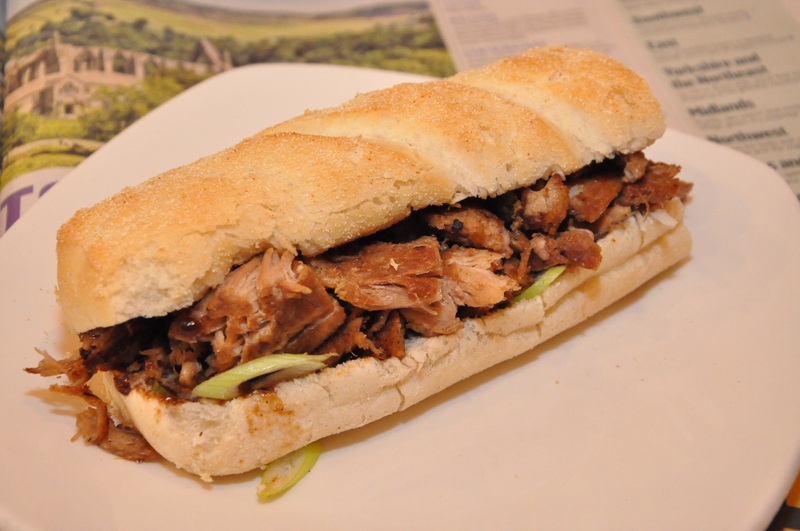 I asked for a small one (£3.50), it arrived in a lovely fresh submarine roll filled to the rafters with soft pulled pork, there was also a sprinkling of sliced spring onions and some hoisin sauce. 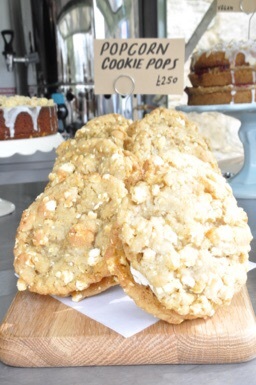 I soon realised why it’s their best seller as it was VERY tasty and definitely a great choice. I was very content, with my pulled pork sandwich, fresh OJ and The Raconteurs playing in the background. 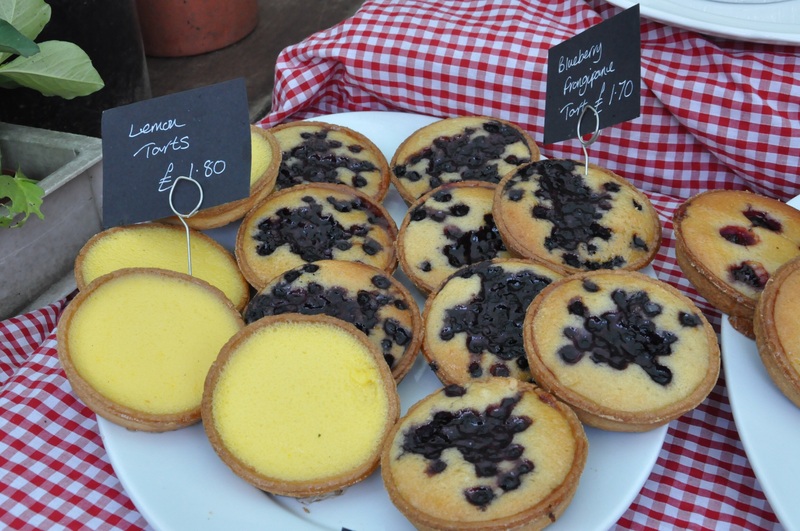 Just goes to show simplicity is extremely yummy! I spied the person sitting alongside me with a rather tasty looking bacon sandwich too and I hear their full breakfasts aren’t nothing to be sniffed at either! 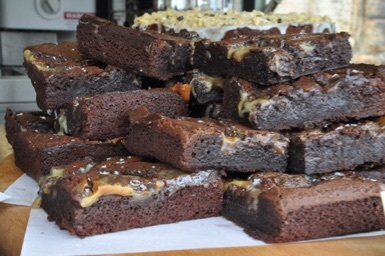 Some of their baked goods are made by Brown & Blond, the artisan brownie makers, and they also have a selection of other sandwiches and salads too. In the future they plan to extend their menu and have more choice for gluten free and also start showcasing guest coffees too, which I’ll look forward to trying out. 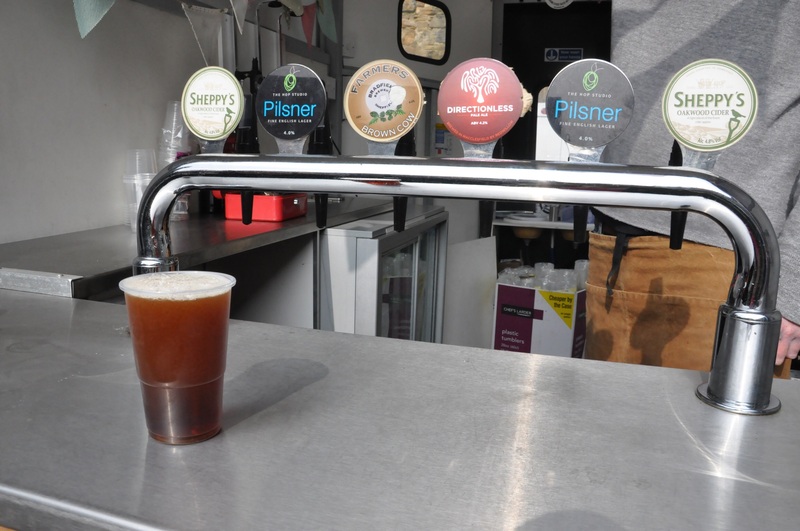 If like me, you’ve never seen or heard of Froth & Fodder before give it a try, you can relax in there, do a spot of work whilst having a good feed and listen to some great music at the same time. 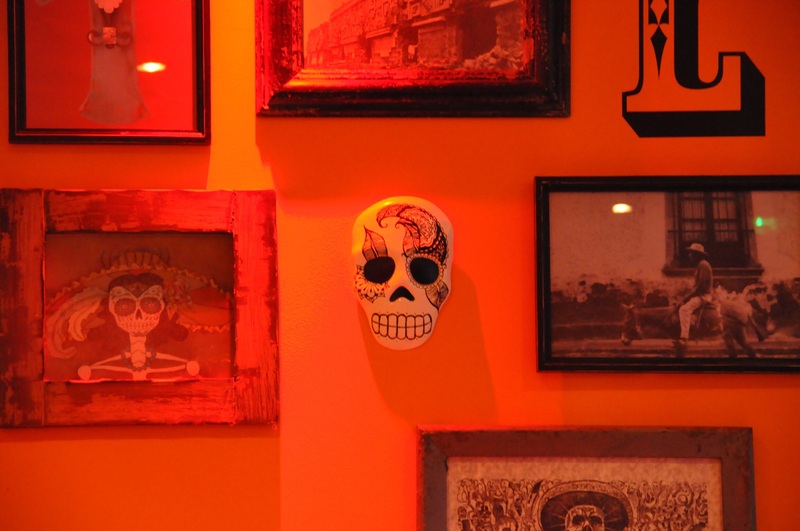 There are a number of similar establishments on the same stretch of Leeds which may lure you in, but this is one you should give a chance if you haven’t already. Wow. So this is what 2 Michelin star food is, and my goodness it’s good. But that’s a no brainer; what was incredible, was the whole experience – getting a taste of how you imagine the other half live, being treated like royalty! Restaurant Sat Bains only offer tasting menus and on Saturdays that means ten courses of rich, heavenly and decadent food. 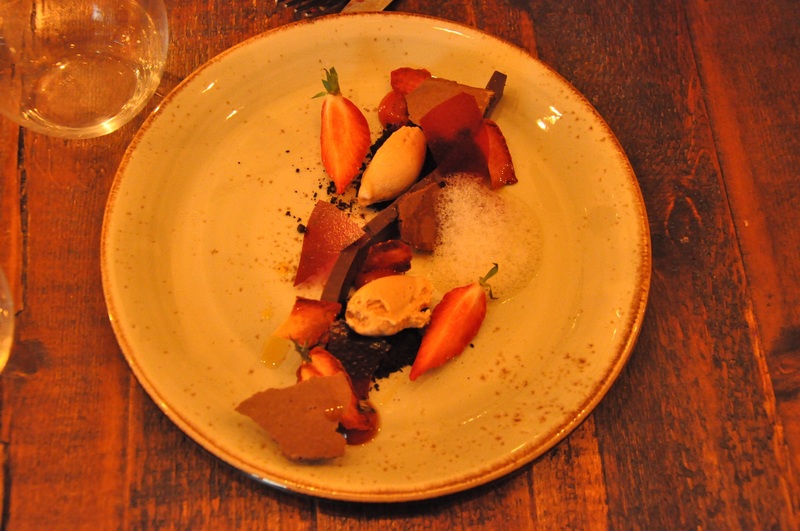 The style is very modern, with each course carefully designed to accentuate the five tastes of salt, sweet, sour, bitter and umami in varying levels to challenge your palette. Often these tastes were also combined in hot and cold quantities on the same plate to mess with my poor little mind, to an extent that I can’t really articulate how good it was. 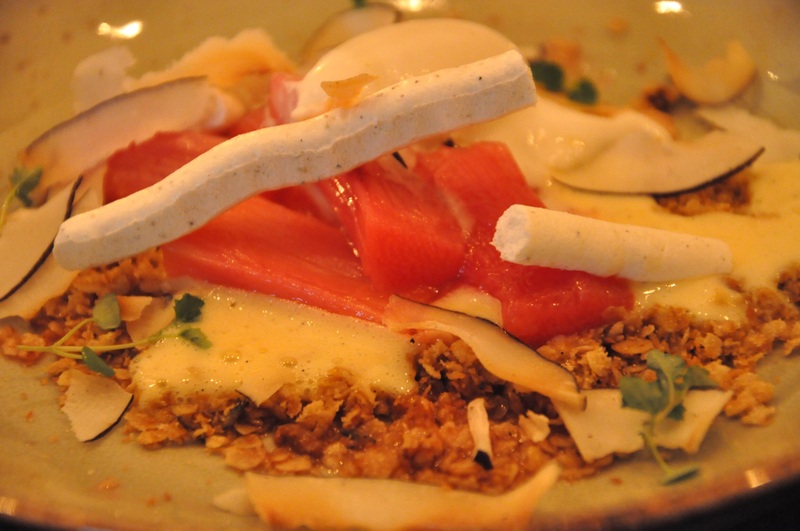 Things like the chicken muesli – frozen chicken liver parfait hidden underneath a layer of granola were delicious, but also challenging; in my rather limited gastronomic experiences I’d never come across such a combination of tastes in a relentless battering of my senses. The highlights were actually things that I’d never eaten before, generally raw things, that we’re delicious in the hands of an expert; raw scallops marinated in ponzu; the most intensely lamby (ok I’m making up words now) sweetbreads and Roe deer cooked three ways – fillet, sausage and tartare – the latter being quite frankly the most delicious thing I’ve ever eaten. There was also one course that I struggled slightly with – the pear and almond finale which had salted jellied almond cubes; I guess that particular combination of salt and sweet on one plate was a step too far for my taste buds, but one that my dining companion enjoyed immensely. 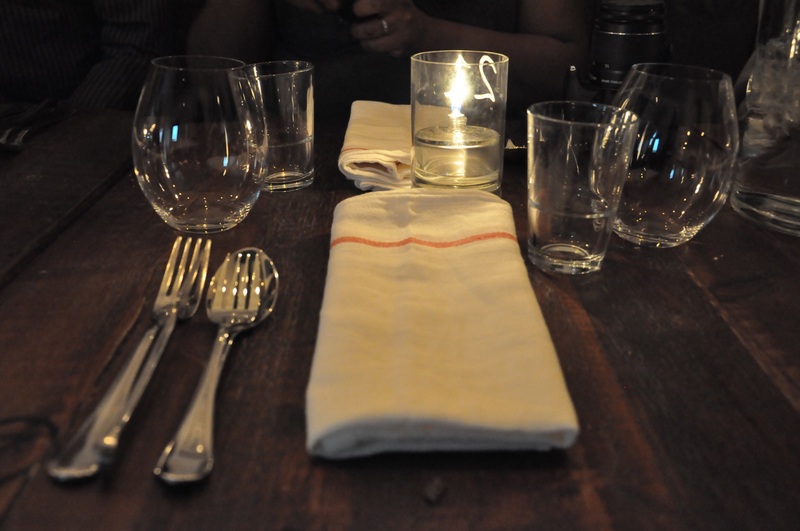 In addition to the delicious food, we went for the ten wine pairings which were just amazing. A lot of thought obviously goes into these things and each pairing was pretty perfect; but I would have been quite happy to drown in a bath full of the 2011 Tinpot Hut Pinot Noir from Marlborough, New Zealand. 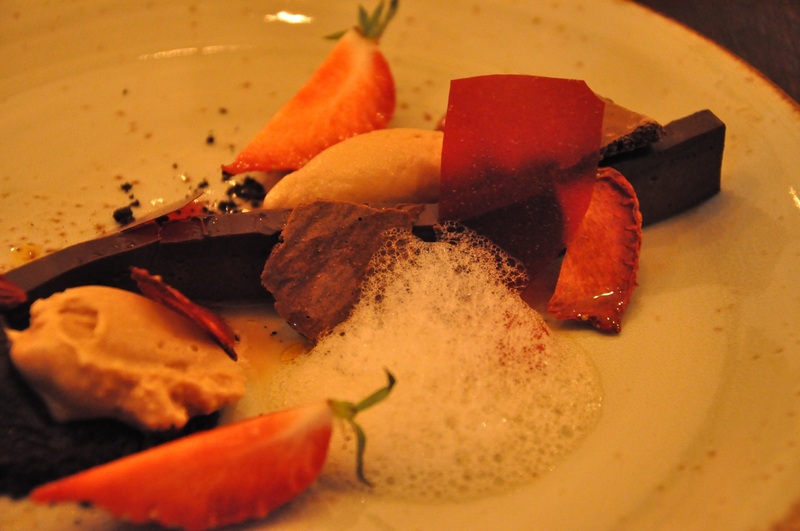 The restaurant had an unpretentious and relaxed atmosphere about it, something I really wasn’t expecting from a 2 star Michelin restaurant; the staff were also wonderfully knowledgeable and keen to speak at length about the dishes, wine and just about everything else. We stayed overnight in a superior room which was wonderfully luxurious with a modern grey decor and Laura Ashley furnishings. As you might expect, all of this comes at a cost, but I’d argue that when you compare it to others of this ilk (Le Manoir aux Quat’Saisons springs to mind) it was actually very good value. This experience was a Christmas treat and whilst you’d never be able to eat here every weekend, as a one off mega treat it was right up there with the nicest weekends away we’ve had. That’s not to say you can’t grab a bargain either – if you can get away midweek and book at least a month in advance, a seven course taster menu, room and breakfast is only £140 per person. The most impressive and striking image I’ll remember from the weekend however was at midnight, when the Chef himself (despite looking absolutely knackered) came out from his kitchen to speak to as many guests as possible. You would imagine that after a mammoth shift that it would be the last thing he would want to do, but armed with a glass of white he spoke to everyone. It was a lovely touch, and I guess something I wasn’t expecting. He is obviously a believer in the idea that if it’s your name on the door and people come from far and wide and pay good money to sample your food, you better be the one doing the cooking. This idea of the chef patron also got me thinking – so often in Leeds I dine at larger, often chain based restaurants rather than the smaller chef patron eateries; I need to do this more as these are quite clearly the most passionate people in the business. 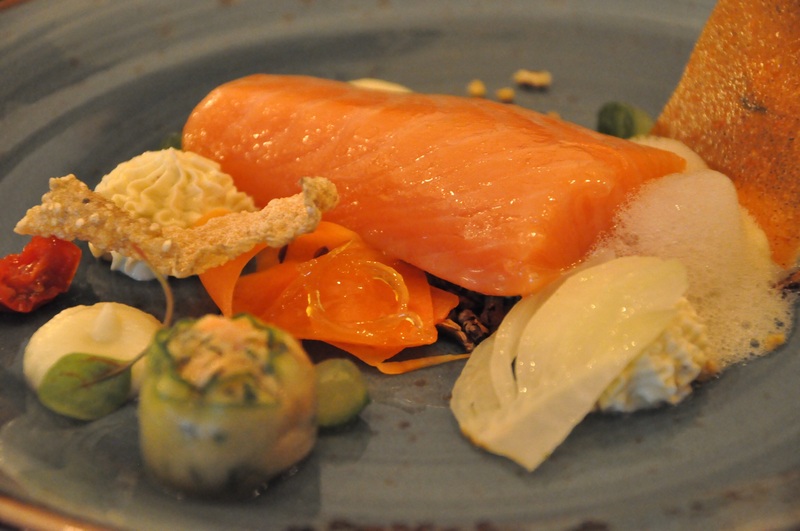 Last week I attended a tasting session at Nord, the soon-to-be restaurant off-shoot at Baltzersens, Harrogate’s popular Scandinavian cafe. 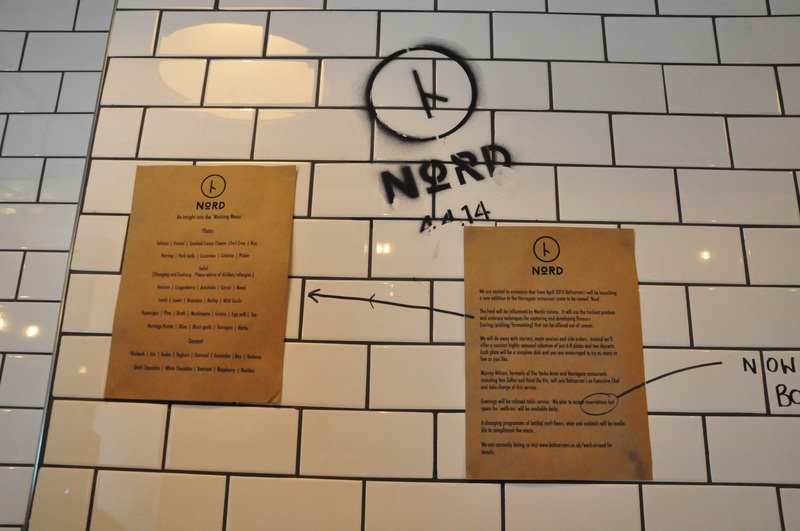 The name ‘Nord’ means ‘North’ which is meant to reflect the style of the food to be served and also the location of the restaurant. 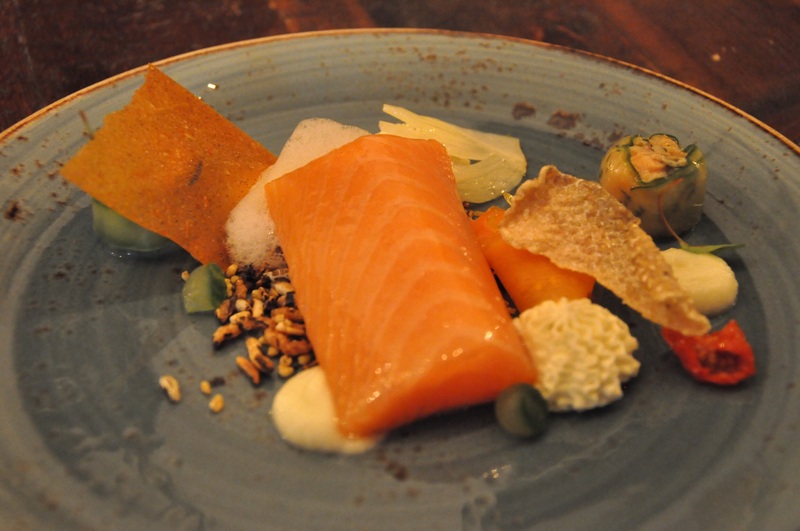 Headed up by chef Murray Wilson, he is one with high credentials, previously working in Michelin starred The Yorke Arms and Van Zeller, also a runner-up in the first series of Professional Masterchef. 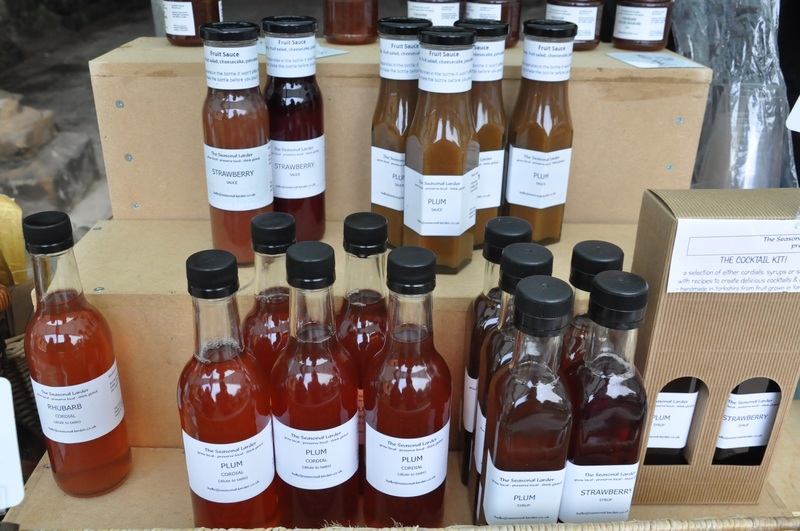 The ethos of the food will take on a Nordic influence, using techniques such as pickling, fermenting and curing to develop flavours from ingredients out of season. 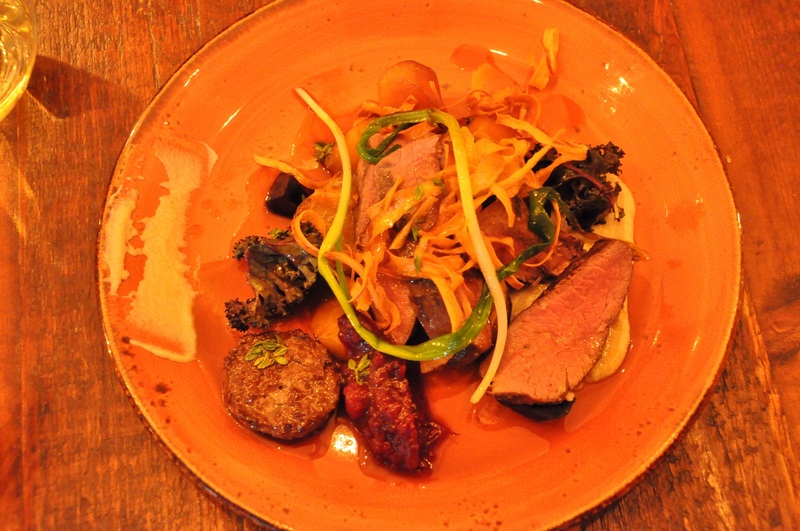 Nord’s menu is based on 10 seasonal dishes, doing away with the usual starters, main courses and side orders, but instead consisting of 8 plates and 2 desserts. 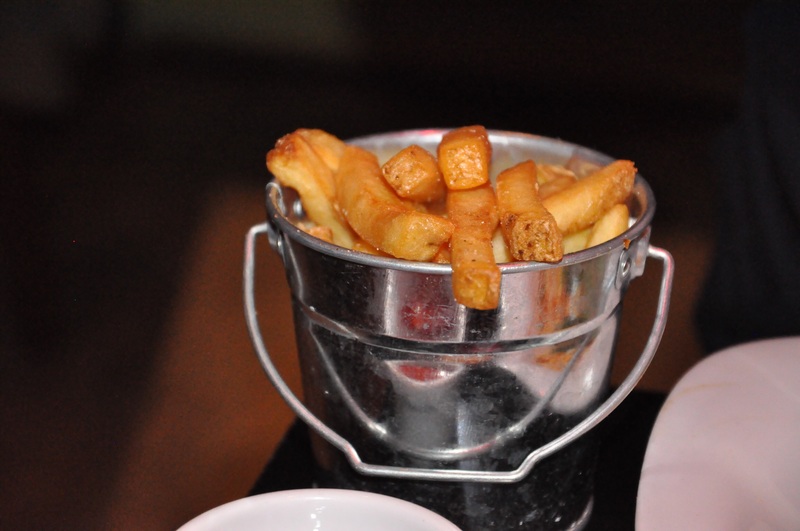 The idea is to try as few or as many as you like, they can be eaten as sharing or individual plates. 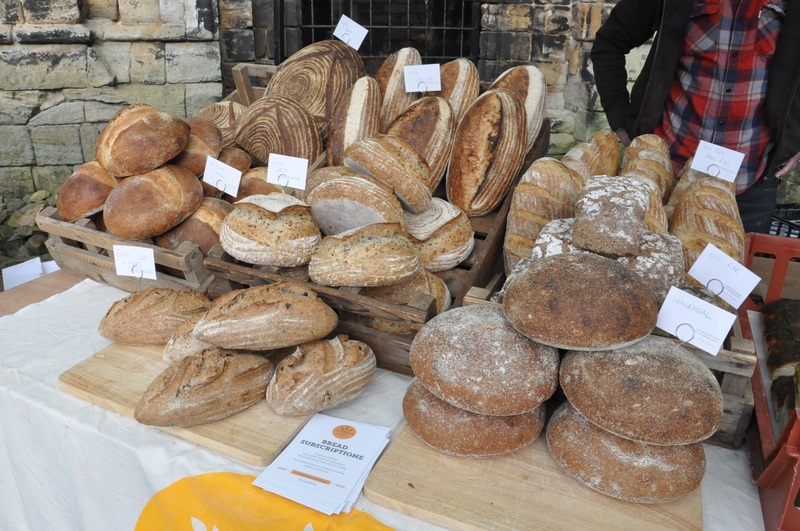 Alongside the menu they will offer a range of bottled craft beers from Bad Seed Brewery, based in Malton, wines and in-house cocktails to compliment the menu. The evening I attended was the 4th day into the tasting sessions, throughout the week the aim was to improve/refine/develop each dish following critique from guinea pig diners like myself. 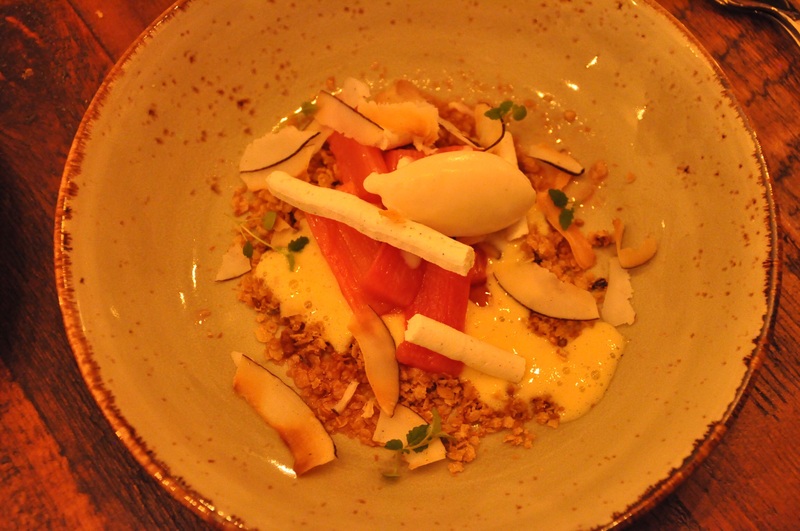 With full knowledge that the menu was in its development stages I’m not going to comment on the dishes until I visit when Nord officially opens. We tried 3 main plates and 2 desserts, here they are in order, all of them looked absolutely beautiful in terms of presentation and my photos don’t really do them justice. 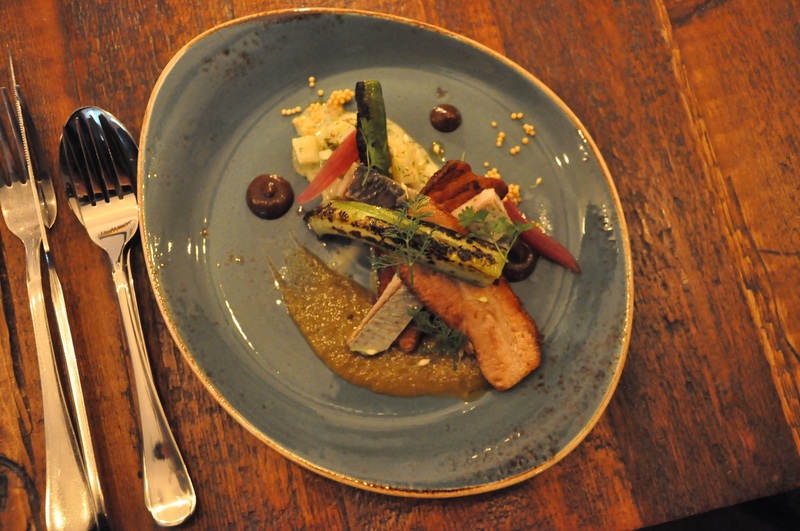 The evening was a very enjoyable one, full of picture perfect plates of innovative food, complex flavour combinations, and also great conversation with other people who have the same love of food as my own. The menu is undergoing its final stages of development, with Nord due to open on 4th April I fully intend to go back soon when the Nord is up and running. 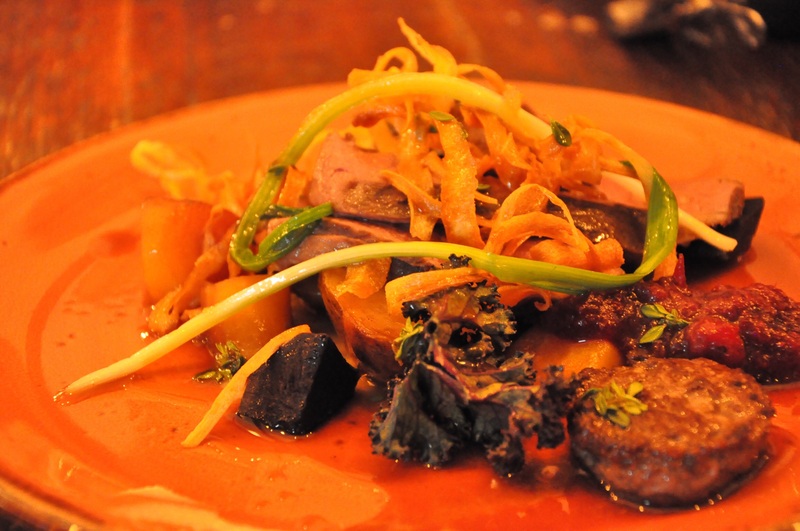 It’ll be interesting to find out how the dishes have evolved and see them fully realised. 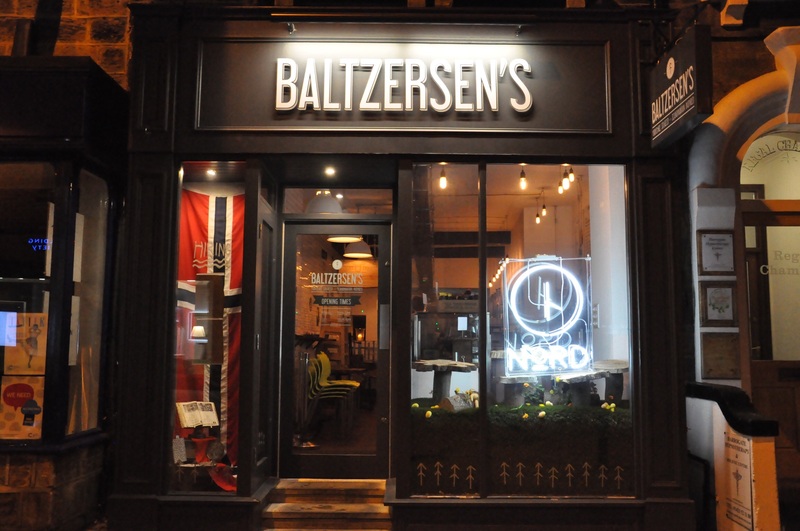 Disclaimer: I was invited by Paul, owner of Baltzersens to try out the dishes so my meal was a complimentary one, in exchange for an honest critique of the menu. 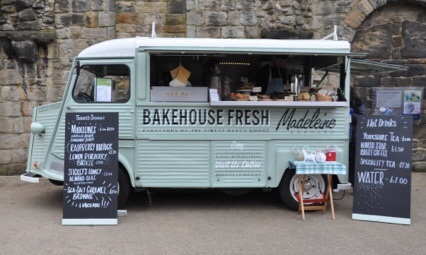 Madeleine Express from Noisette Bakehouse with their delicious baked goods. 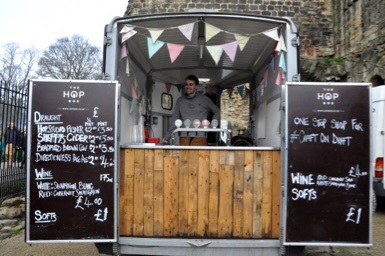 The Hop Box from Sheffield, with their mobile bar service serving craft beers from independent micro-breweries. 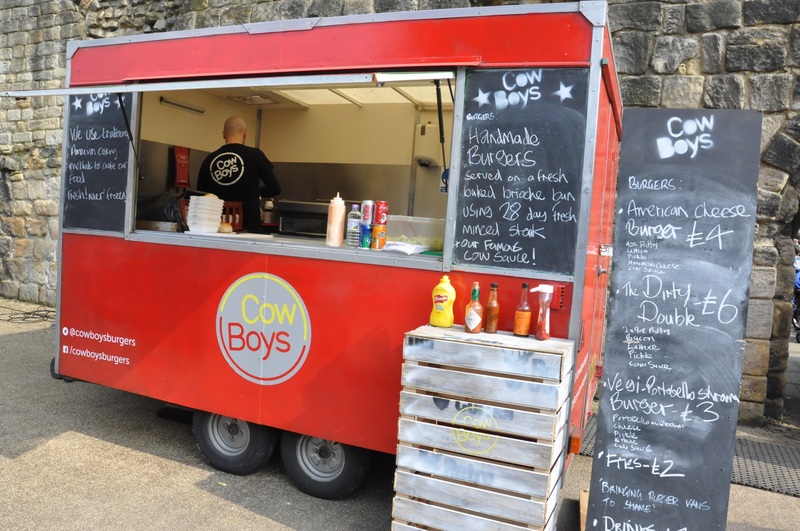 Cow boys based in Sheffield selling their handmade burgers. 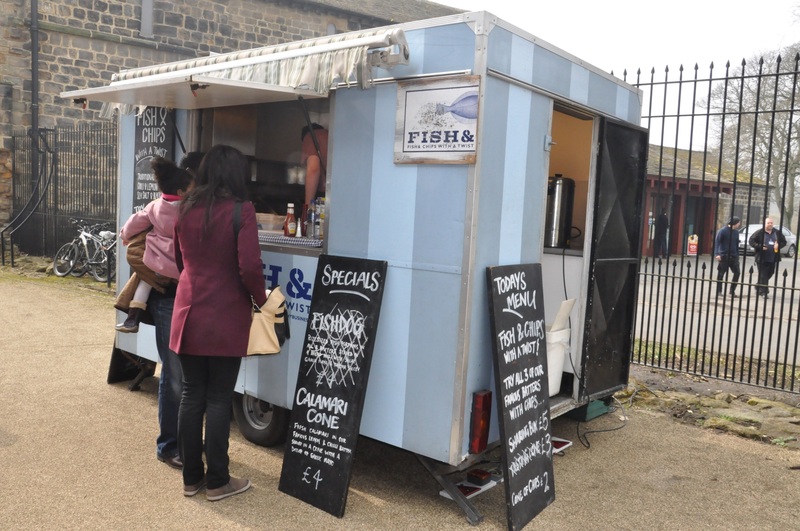 Popular Leeds based Fish& with their well-known twist on fish and chips. 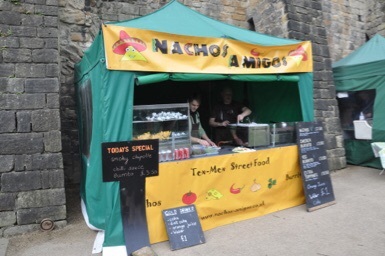 Nachos Amigos with their Tex Mex style Mexican street food. 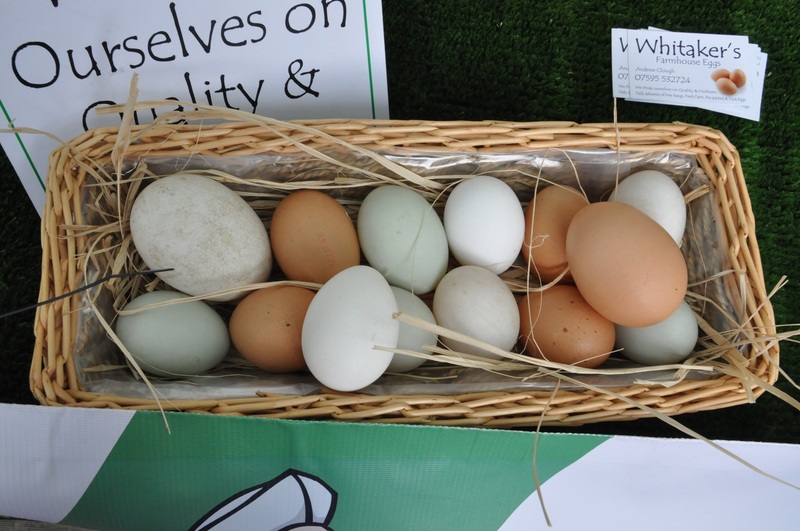 The Cracked Pan originally served their classic, french style omelettes, inspired by the recipes in Elizabeth David’s French Provincial Cooking using local ingredients. 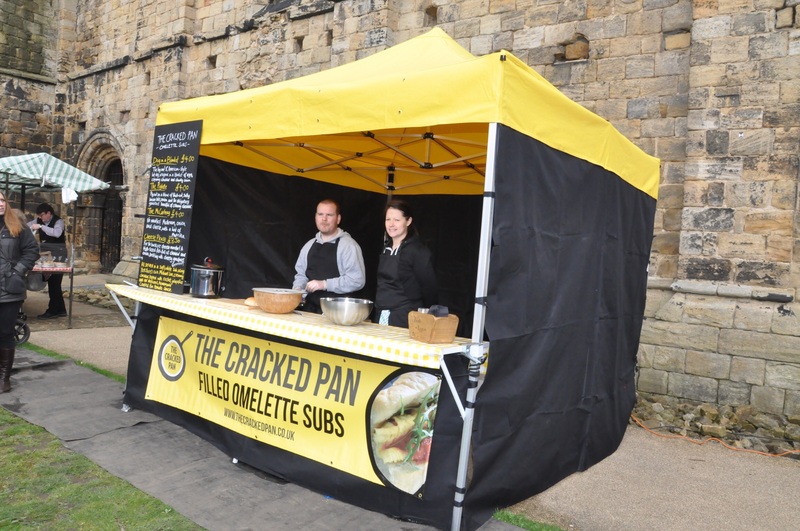 Now their original idea has developed into the ‘omelette sub’. 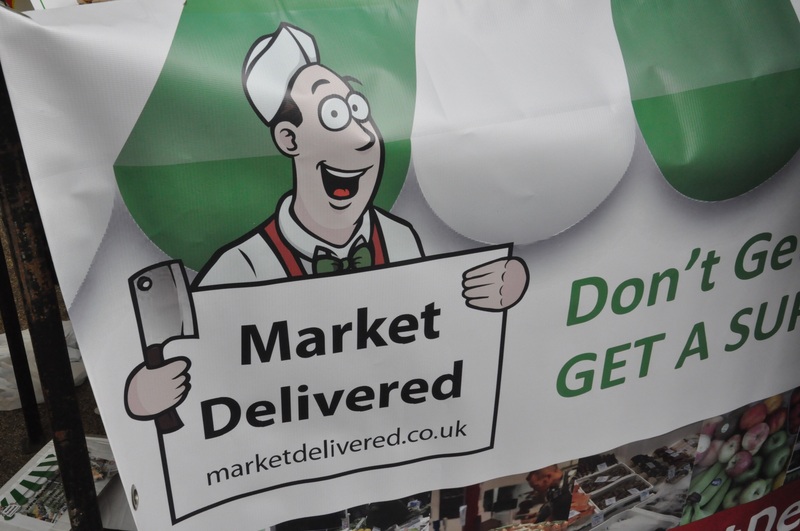 Market Delivered, originally based outside Todmorden they want to serve the wider community with local produce from local Markets. 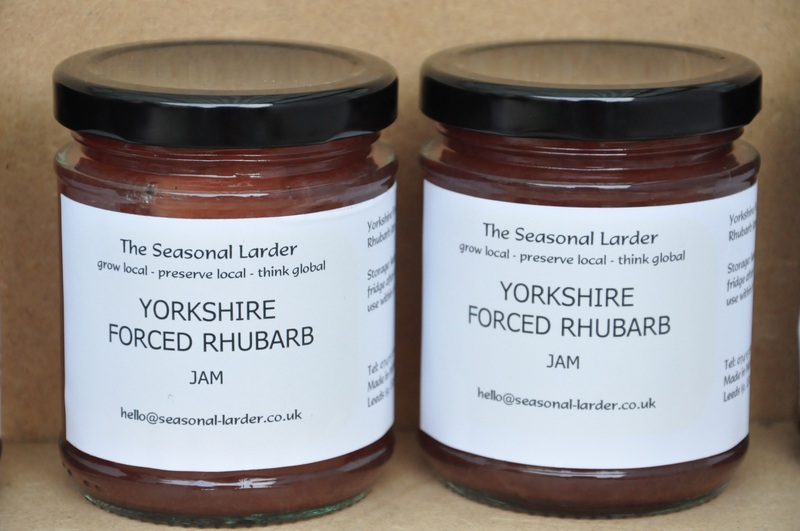 Sourcing originally from Todmorden Market, this has now branched into Halifax and Kirkgate Market too. A fantastic idea! 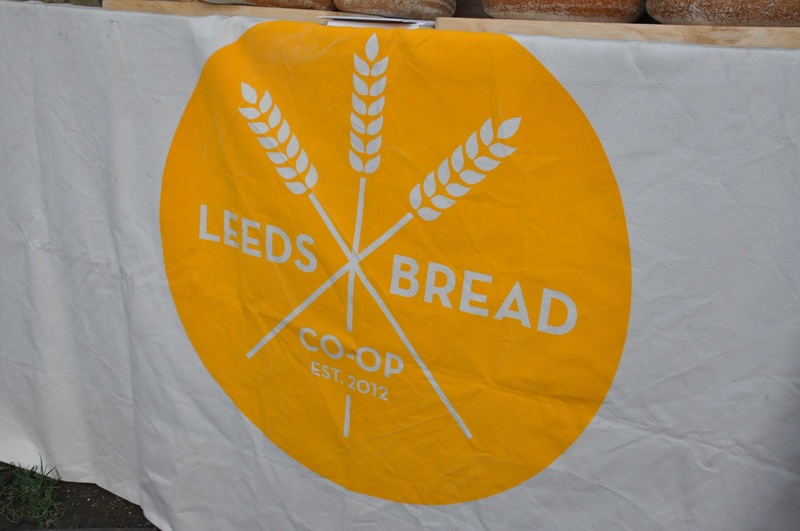 Well known artisan bakers Leeds Bread Co-op with a lovely selection of their breads, including a Wild garlic Foccacia which looked and smelled amazing. 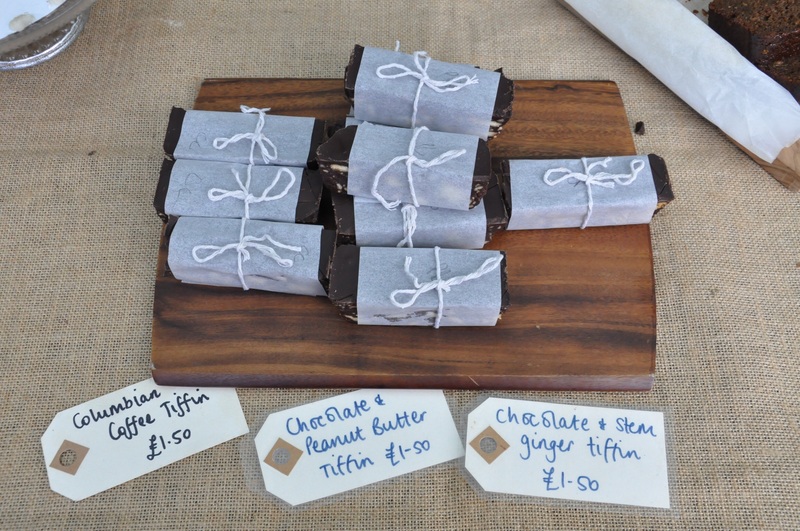 A wide selection of bakers were on show at the Market, as well as Madeleine Express there was Oat Cuisine with a large range of speciality flapjacks and other treats based on the humble oat. 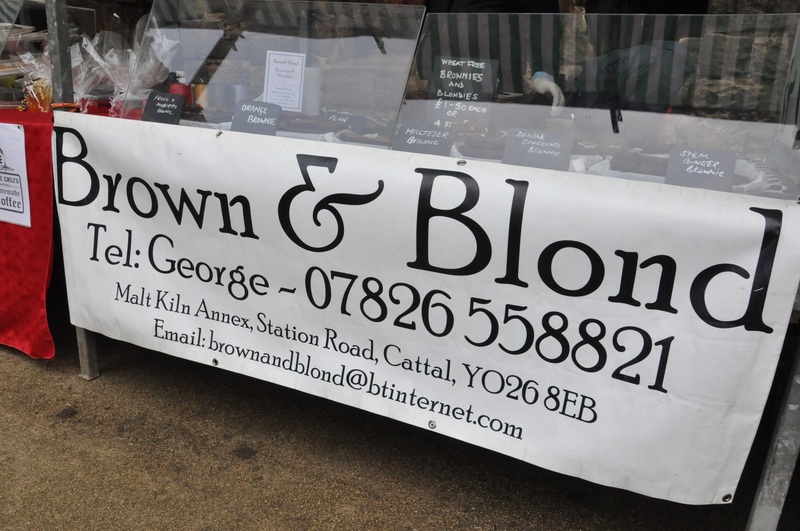 North Yorkshire based Brown & Blond with the delicious looking brownies, ones which looked particularly good were their Stem ginger Brownies. 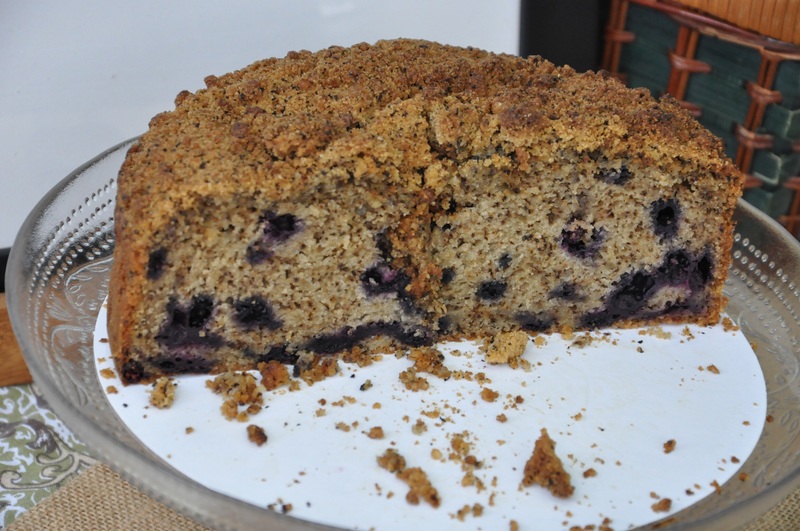 Leeds favourite, Vegan Bakery That Old Chestnut were in attendance with their great produce as always, including their new creation Blueberry and Earl Grey cake. 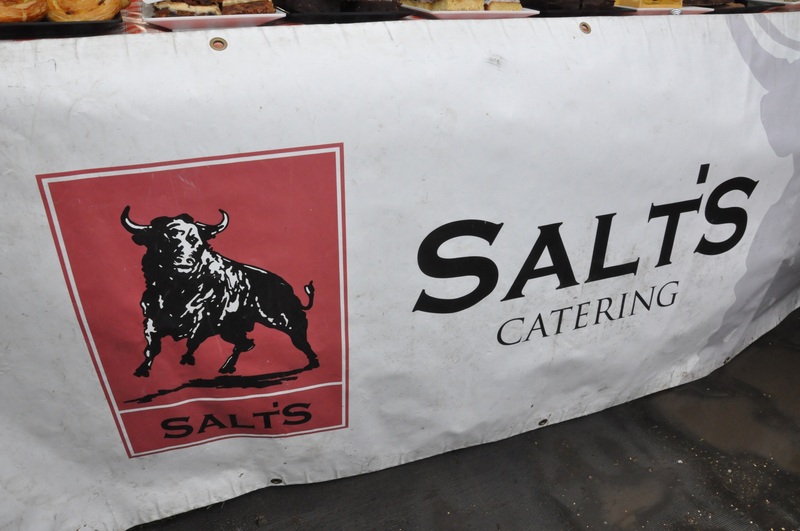 Leeds based Salt’s Catering had a very tempting range of sweet and savoury goods on display. 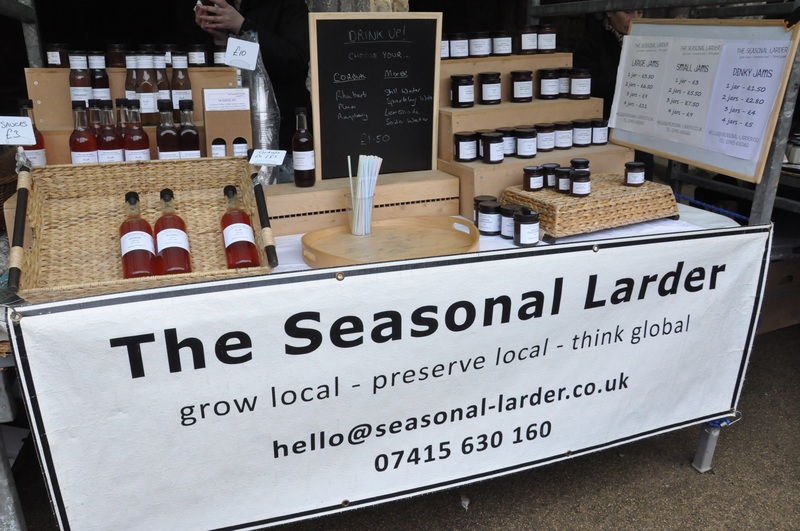 The Seasonal Larder had their handmade preserves using local & seasonal fruits, vegetables, flowers and herbs on display. 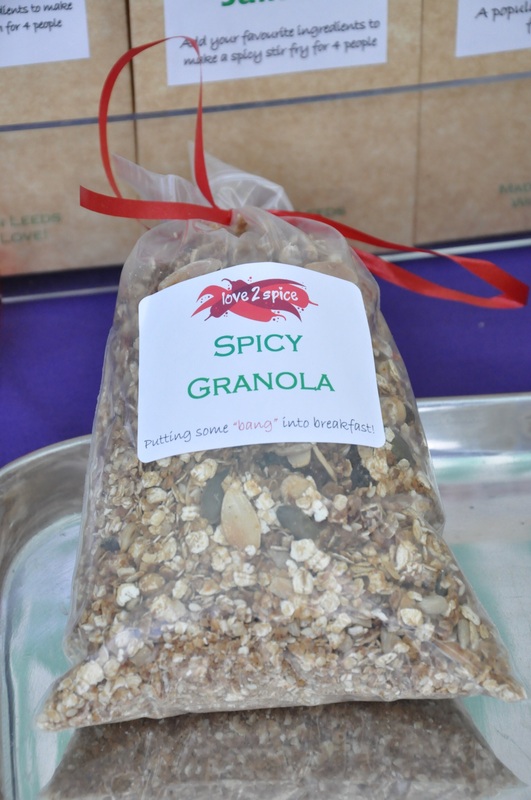 Leeds based Love 2 Spice with their range of spices and especially good Spicy granola which was had lots of different layers of heat. 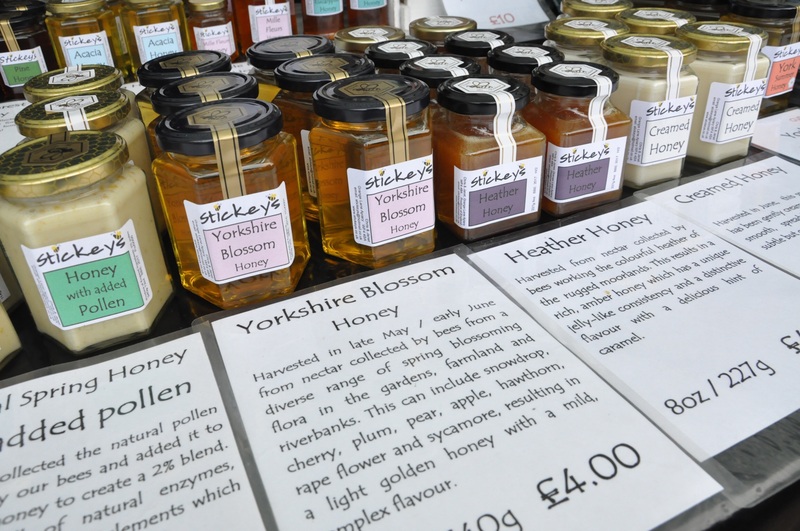 Award-winning Flockton based honey producers Stickey’s. 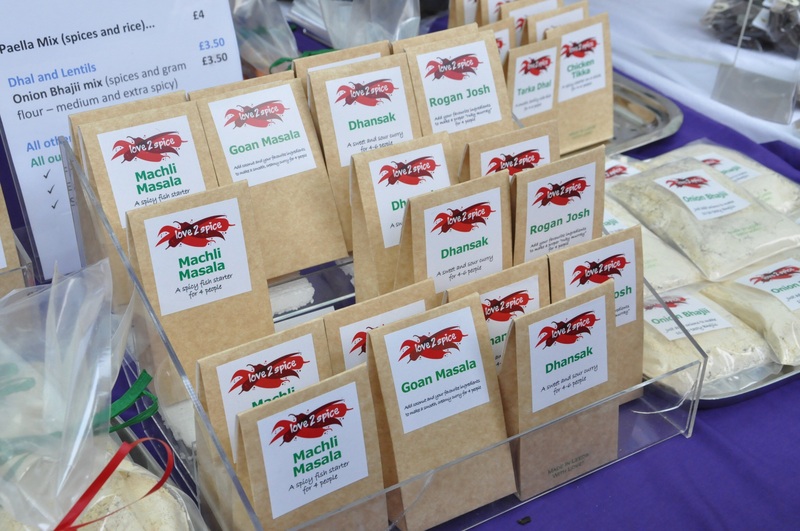 For my first Kirkstall Deli Market, it was great!! 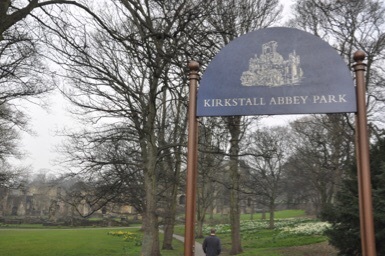 It’s in a beautiful setting being in the grounds of Kirkstall Abbey, it won’t be my last as they’ve got so much eye candy on offer. Unfortunately, I didn’t get round to eating a single thing on this occasion, but I’ll be making room for some goodies next time! 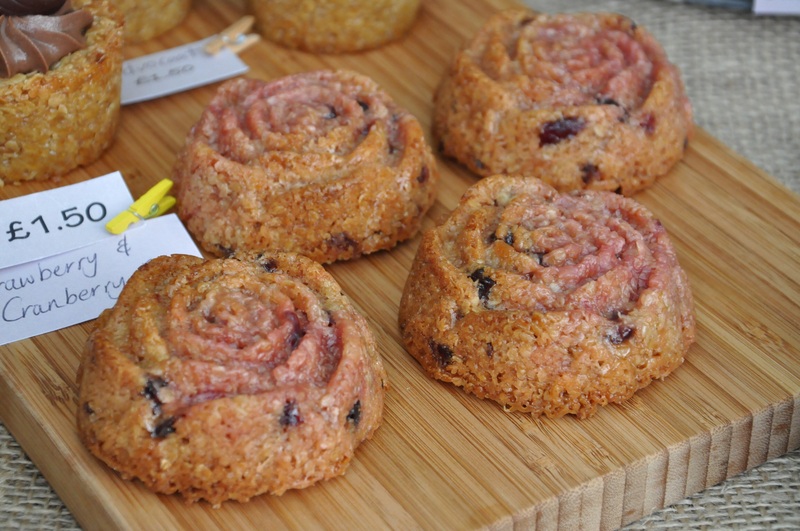 (2nd Saturday of every month), 9am-12.30pm. 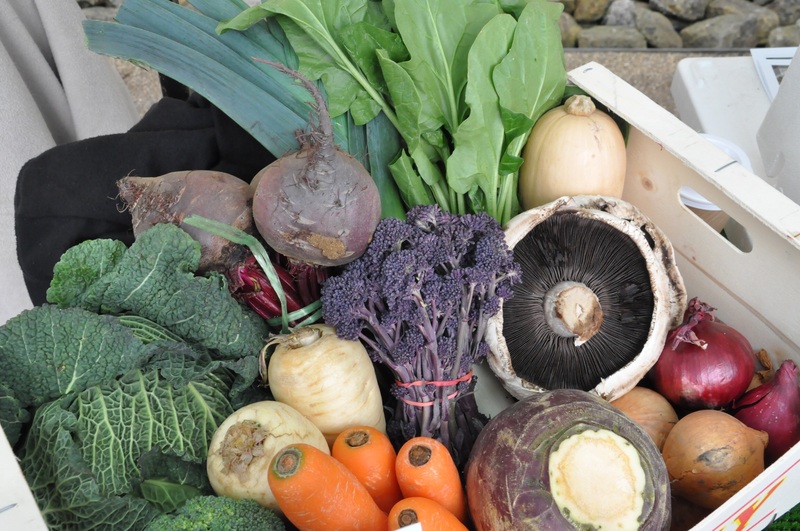 Horsforth Farmers Market (1st Saturday of every month), 9am-12:30pm. 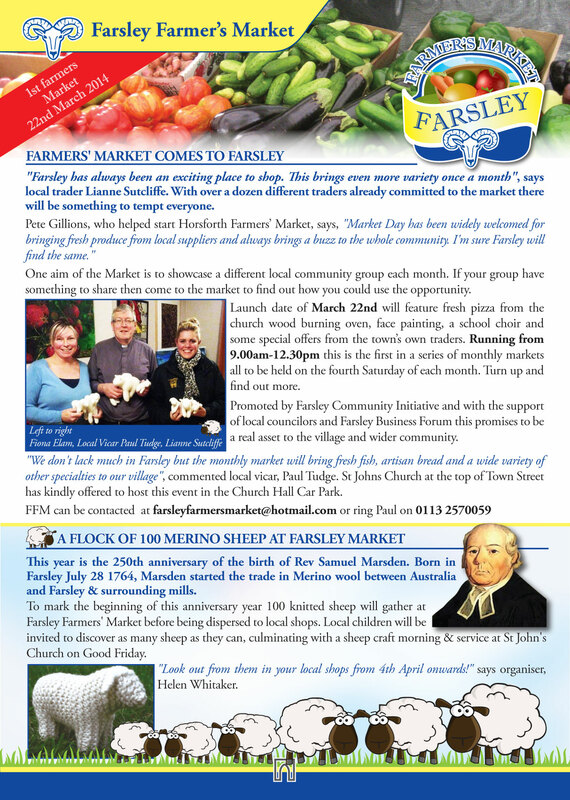 Farsley Farmers Market (fourth Saturday every month) 9am-12:30pm. I hadn’t seen the other half all week due to work commitments so Saturday evening we decided to go out for dinner. For some reason I was lacking inspiration and couldn’t muster any decent ideas of where we could get a good feed, especially from somewhere we hadn’t tried before. 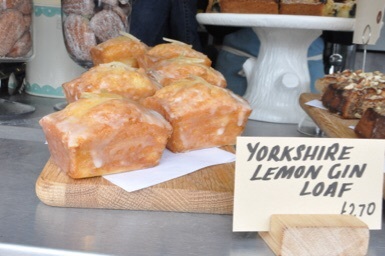 Leeds foodie Twitter folk came to the rescue and gave me a couple of great ideas of places that have been on my list, but I’d forgotten about. 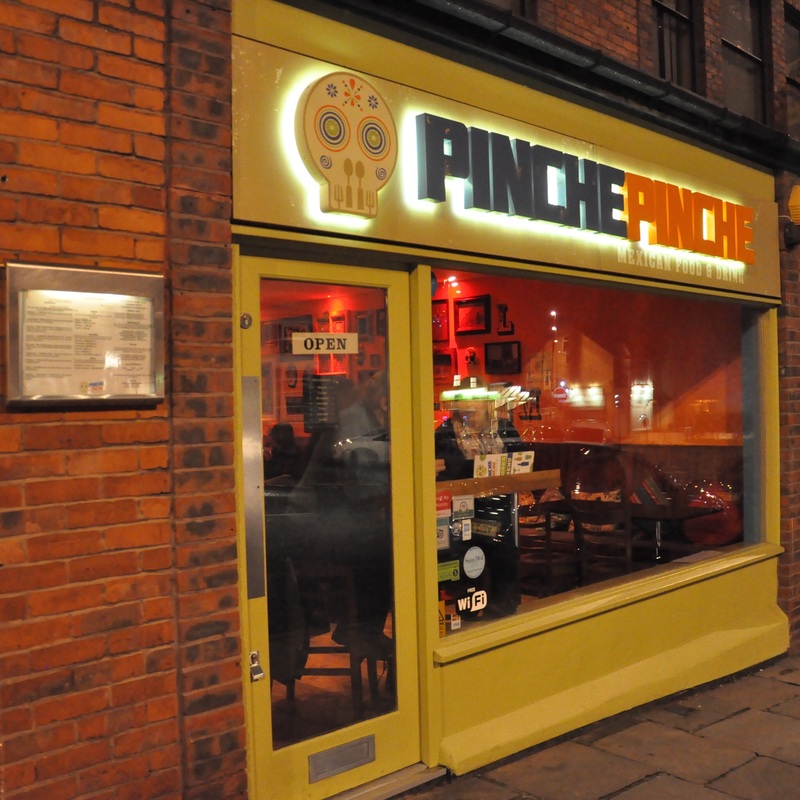 Out of the two, we decided on trying Mexican restaurant Pinche Pinche, based in Chapel Allerton it’s a restaurant I knew of through glowing reports I’d read in the past. 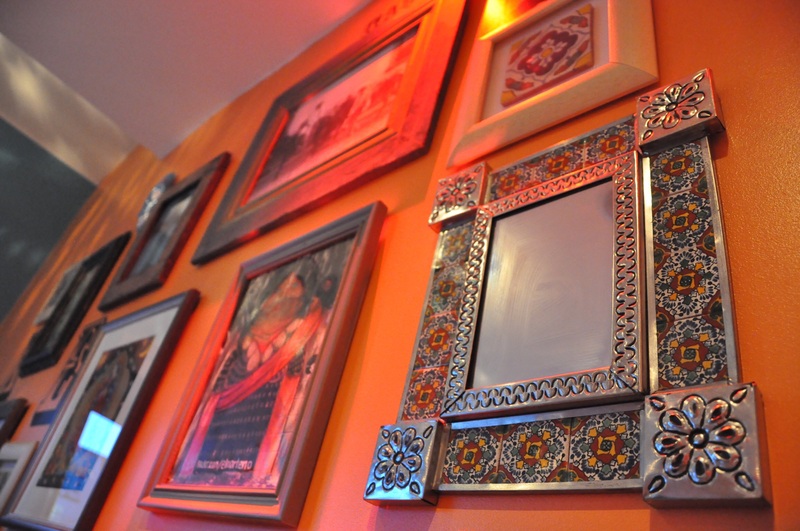 I hadn’t gone out for Mexican in while so it made a refreshing change. It’s located on Harrogate Road, right in the centre of the action in the area and luckily we managed to park outside courtesy of the free on street parking. It was Saturday evening and it opened at 6pm, so I was hopeful it wouldn’t be too busy if we arrived before 6:30pm. On arrival we were nearly out luck as they were pretty much booked up till much later that evening, but thankfully we managed to nab the window seat which we duly accepted. The menu is broken down into Appetizers and tapas, salads, Enchiladas, Northern Mexico/Tex-Mex (Burritos, Chimichangas, Fajitas Nachos and Ribs) and sides. There’s also a children’s menu too. I was pretty hungry after just having a yummy bacon and egg sandwich for breakfast and skipping lunch, so we ordered the Pinche guacamole to share first. 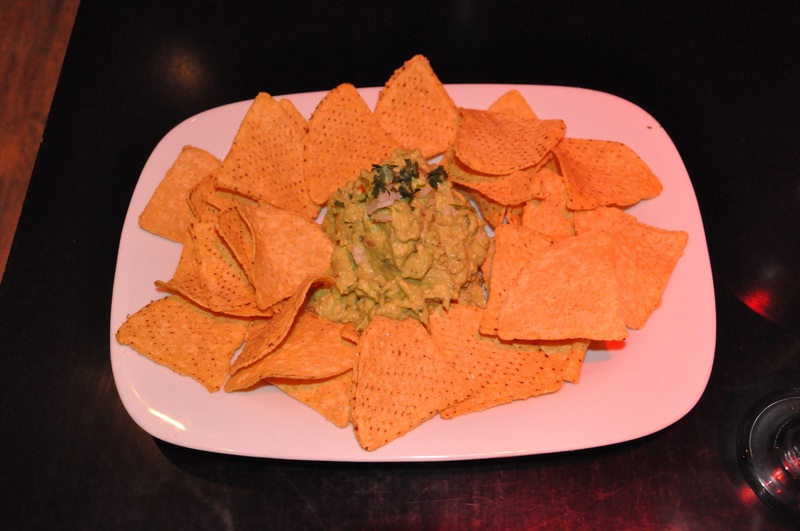 Made with Hass avocados, onion, coriander and fresh lime juice it was tasty and had a creamy texture to it. It was a very large portion of guacamole and we were defeated by it as it was too much for either of us to finish. 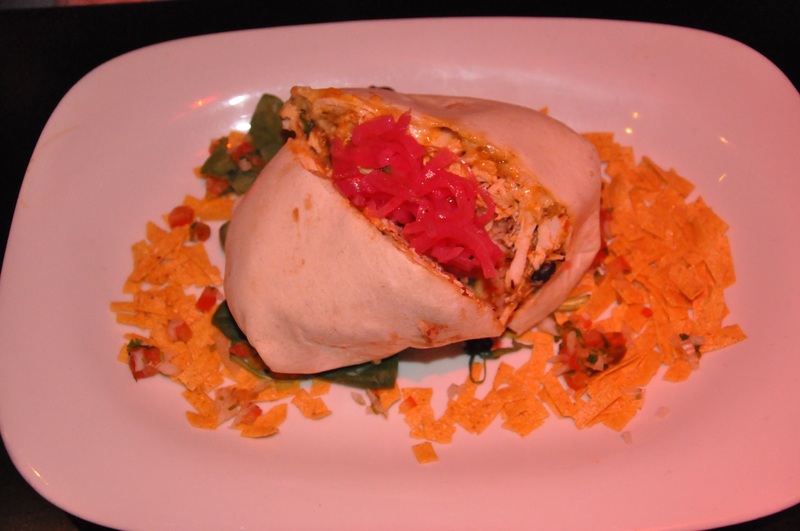 Next up were the main attractions: the other half went for a burrito with chips, yes not strictly Mexican, but Pinche Pinche say they offer Tex Mex dishes as people typically think of these as Mexican, even though they aren’t strictly authentic, but more of a fusion. 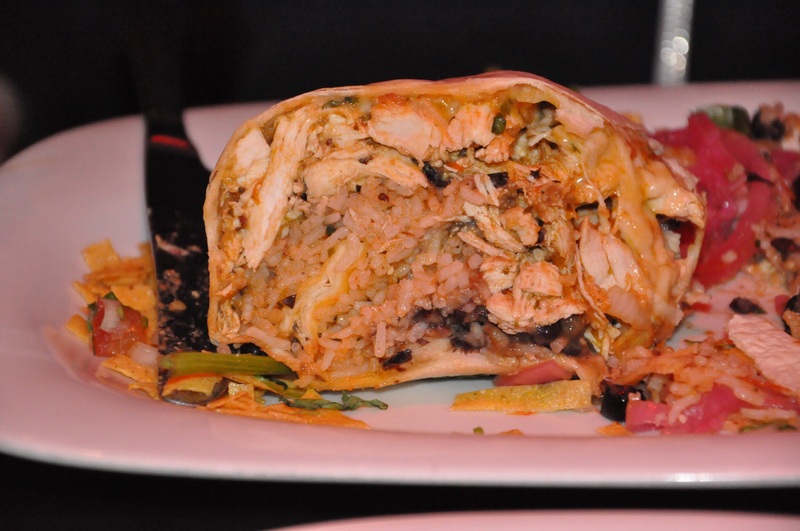 The burrito was absolutely crammed to the rafters with chicken and rice, tasting great. Unbeknownst to me though the other half had eaten a mini curry after his Saturday hockey match so he struggled to finish it all on this occasion. 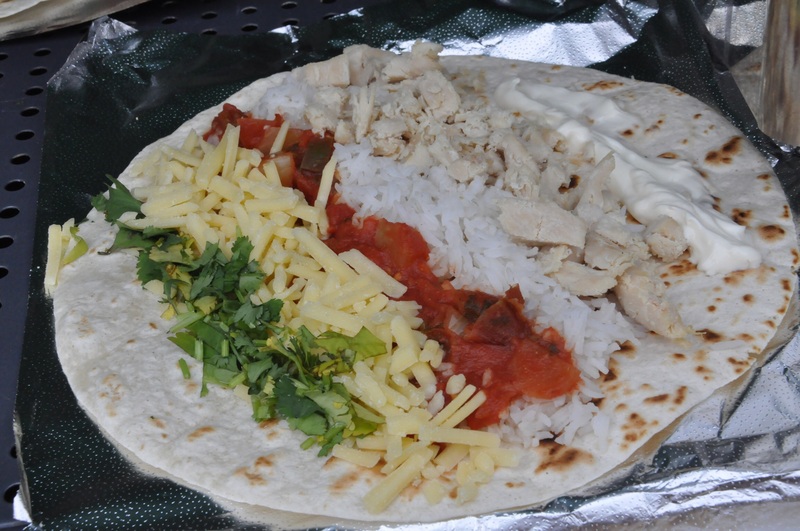 I liked the idea of trying the street food dishes so went for Tostados and Quesadillas, both were really well done with lots of tasty fillings. 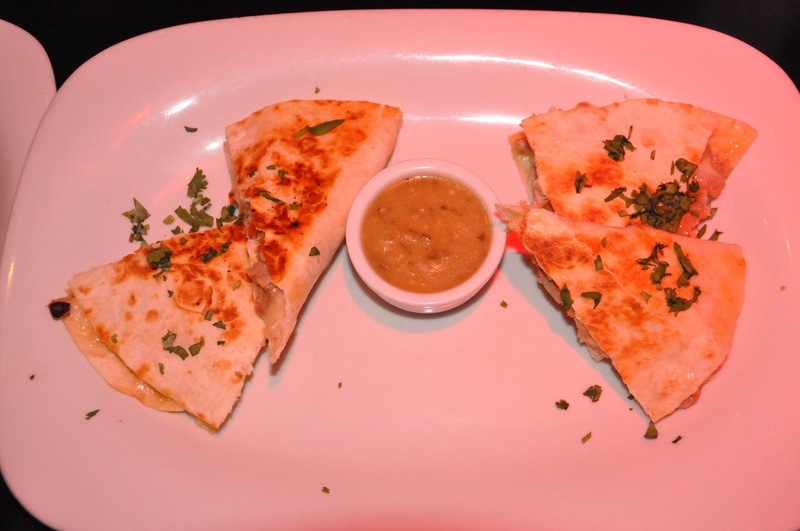 The Quesadillas had a filling of Adobo marinated pork with spicy pan-fried pineapple, the tender meat had a slight hint of pineapple running through it. 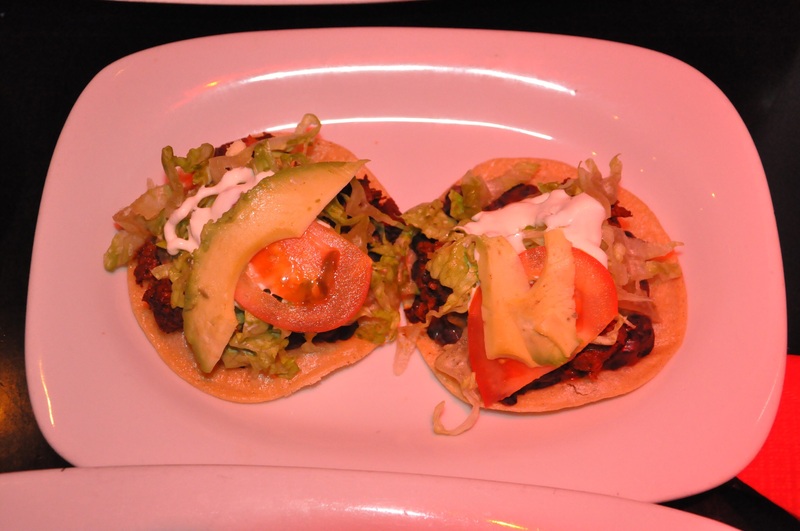 The Tostados were crisp corn tortillas generously topped with slow braised lamb in a Pasilla chile marinade, each had refried black beans and topped with Salsa Ranchera (tomatoes, chipotle chile, onion and garlic) and cheese. The meat was moist, flavourful, the beans were meaty (if that’s possible) and the salsa helped to cut through any richness. 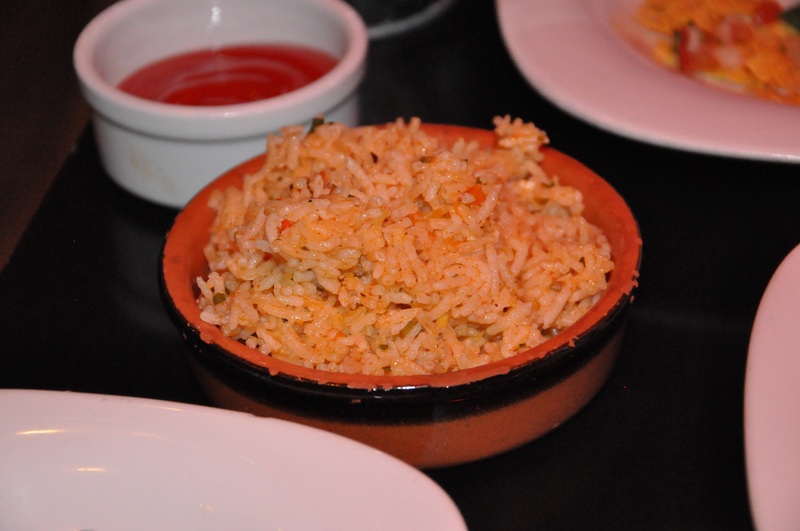 I loved the sides, the rice was fantastic and I could eat bowls of the stuff with finely chopped coriander and parsley running through it, it had a lovely texture and great flavour. 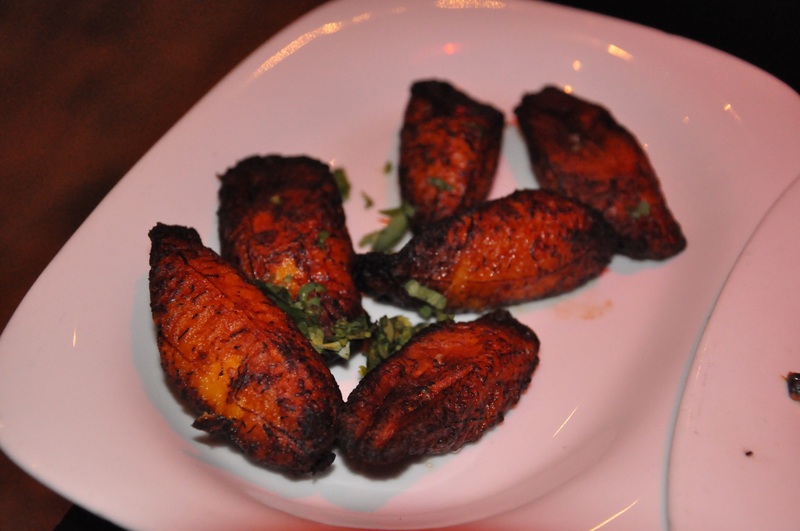 I’ve been a massive fan of plantain since Uni days, where a housemate used to cook it for me in exchange for apple crumble and custard, and then this was even more reinforced on a memorable holiday in Cuba a few years ago. 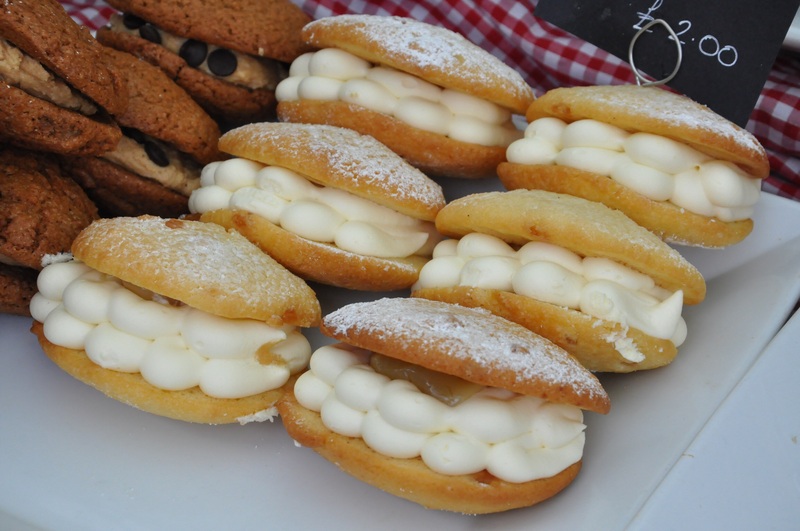 These were lovely, well, cooked with just the right amount of give and softness to them. Our dinner cost us £48.50 for 2 courses each with sides and a bottle of wine. We were both pretty stuffed by the end of dinner, in a good way too! 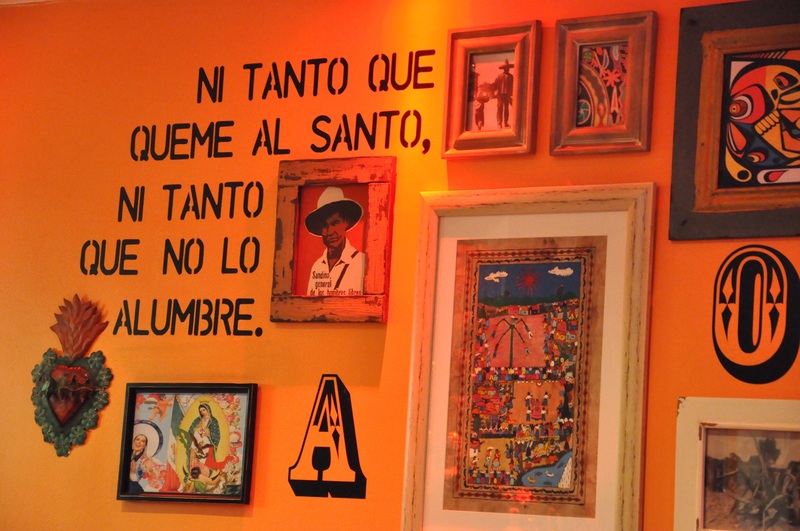 I’d recommend going to Pinche Pinche!! 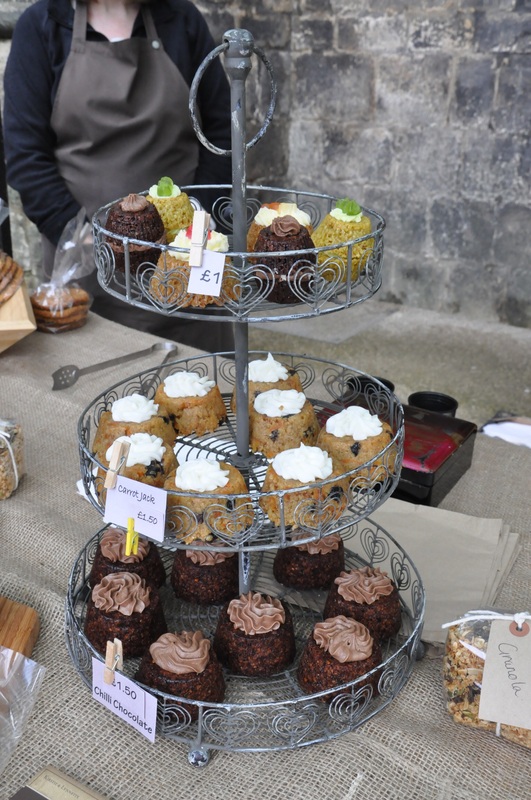 Food: good portion sizes, full of flavour, a great range of dishes with lots to cater for different dietary requirements. 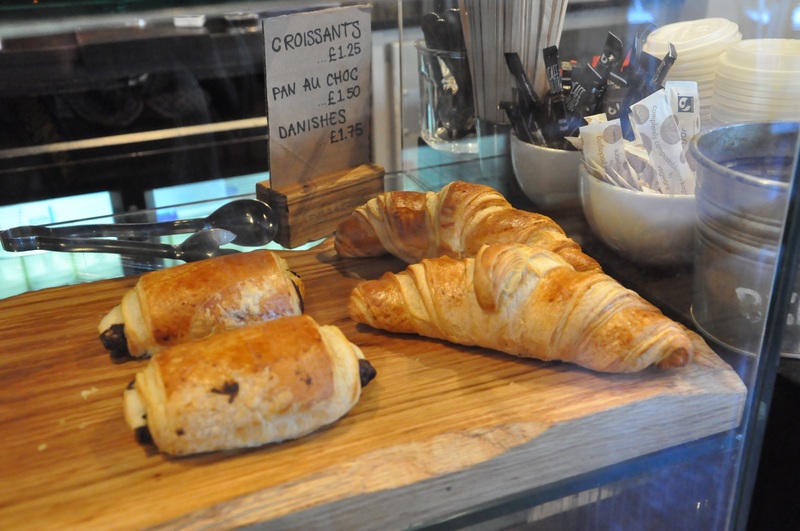 Service: staff were accommodating, friendly and efficient. Atmosphere: had a good buzz at the place. I wasn’t too keen on the red lighting though (from a photograph taking point of view).